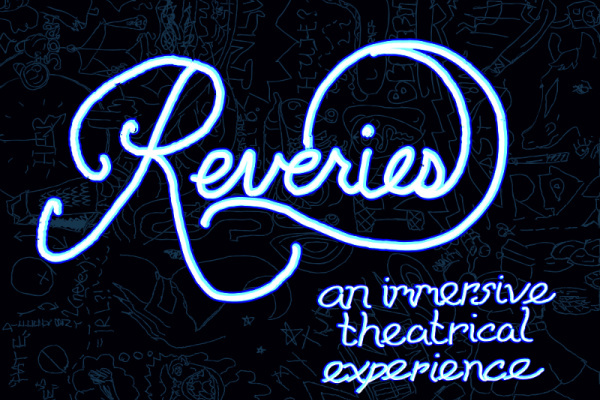 For six performances between February 1st and February 4th, Reveries- an immersive theatrical experience will be taking over The Tank. Described as a devised exploration of the phenomenon that is dreaming, Reveries will integrate installation art, movement, music, and theater for an exciting night that is bound to stimulate the audience's imaginations. Before you head to the show, learn what dreams mean to some of the cast and directors of the show! What is a dream? : A dream is a way for your brain to subconsciously process things occurring in your life. How often do you dream? : Not often. How do dreams affect your real life? : They give me a good laugh. When I do dream my dreams tend to be wacky. Why are dreams important? : They provide an escape. What is a dream? : A dream is essentially your brain processing random thoughts, fears, desires, elements, both conscious and unconscious…like a little movie that your brain whips up, and only you can actually experience. How often do you dream? : I dream pretty regularly. Honestly, often times it’s the most exciting part of the day when I get to crawl under the sheets, turn out the lights, and wonder what exactly I will dream about that night. If it’s vivid enough and memorable enough, I wake up and scribble down as much as I can before it dissipates. Sometimes the actual events are gone from my memory, but a distinct feeling remains. How do dreams affect your real life? : Ooo good question. I wind up thinking about my dreams a lot, both the good ones and the bad ones. Sometimes the nightmares are more insightful than anything else. The ones that I am able to transcribe serve as inspiration for other thoughts, or instigate shifts in beliefs and attitudes that I have held on to for one reason or another without questioning them. If nothing else, they keep the creative energy flowing. Why are dreams important? : On the one hand, dreams are the result of a resting brain doing what it needs to do in order to keep the body healthy. So on that level dreams are good signs, keeping the brain sharp and all that. Then, yes, it’s also important to pay attention to these little vignettes, because they are surely telling us something, and we need to listen. And then there are dreams, as in hopes and aspirations, which just like sleep dreams, can seem elusive and fleeting, but are essential to living one’s life to the fullest. What is a dream? : A dream is what happens to your mind when it’s free to wander. It’s a form of mental travel. I go places I’ve been, but also to new imaginary places. How often do you dream? : I’m dreaming constantly. I get lost in stories, I daydream, I imagine the future, and I revisit the past. I don’t remember my dreams at night very often, though. How do dreams affect your real life? : My dreams give me perspective on reality. I can live through impossible circumstances and become a different person, so I can get a wider view of the world. If I want to know how I’m really feeling, I let my subconscious mind run wild in dreams. Movies, plays, and books can have a similar effect because they take your ego out of the equation. By contrasting your life and someone else’s, whether in a dream or in fiction, you can learn a lot about yourself. Why are dreams important? : Dreams are a chance to let your mind expand. They’re your mind’s exercises, simulations that help keep it ready for anything. They’re thoughts, but free-form, and since they’re unfiltered, they give you a chance to get to know yourself better. I think of dreams, sleeping or awake, as an open window into a person’s soul; Reveries has a lot of windows for the audience to peak into! What is a dream? : A dream to me is a little world you can escape to within your subconscious. How often do you dream? : I do not dream very often but when I do they are very surreal. I think my dreams take a lot of energy so my body conserves them. How do dreams affect your real life? : I don’t like to read too much into dreams but they affect my life in terms of analyzing what is going on in my headspace. Why are dreams important? : Dreams are important because they can be telling of circumstances in your life. They also reveal things to us that we don’t want to admit. They allow us to relive things in ways that feel real. Dreams are mysterious and I love dreaming. What is a dream? : Dreams are products of imagination, shaped by our desires and instincts, and influenced by the world around us. How often do you dream? : Almost always when I'm awake and three or four times a week when I'm asleep. How do dreams affect your real life? : Dreams are a critical proponent of my work. My art is continuously influenced and inspired by my dreams. Why are dreams important? : Dreams can deviate our lives from a mundane daily routine. The engage our sense beyond what we may be accustomed to and allow us to view the world from infinitely many perspectives. What is a dream? : A dream to me is an altered state of consciousness where fantastic stories occur and are created. How often do you dream? : I daydream quite constantly, often getting me into a little bit of trouble. I dream at night pretty frequently as well. I may not remember every dream and detail but I usually can’t get through a day without recalling something I’ve dreamt the night before. How do dreams affect your real life? : Dreams allow my imagination to flourish and run freely. More often than not I have difficulty distinguishing reality from something I may have merely fabricated in a dream or daydream. It makes for some awkward conversations and insecurities on my part. Why are dreams important? : Dreams are important because they allow us to see other than what’s directly in front of us. We can see in between moments and imagine the future. Dreams give us insight and also motivate us to live colorfully. What is a dream? : Dreams, in all their forms, are direct experiences often as vivid as reality and yet somehow distinct from it. How often do you dream? : I rarely recall dreams from my sleep, but I’m always dreaming in my waking life. How do dreams affect your real life? : Dreams always seem to be there to remind me of what I’m really passionate about. Why are dreams important? : Dreams are the portal to our inner visions; where thinking fails, dreams reveal to us what we were unable to process consciously. What is a dream? : To me, dreams are what is in your mind subconsciously. It can be a fear, a want, or desire that you may not be aware of. In a state of deep sleep, your mind has no control and therefore brings out these images through dreams. How often do you dream? : Very rarely, but when I do it is either really horrifying or just very senseless. How do dreams affect your real life? : I've had dreams in which I lose a loved one. These kinds of dreams make me appreciate what I have in the real world and to hold on to it while I'm still able to. Why are dreams important? : Sometimes a dream can help you understand what your mind may be going through. It can bring some clarity or be eye-opening to events in your life. How often do you dream? : I pretty much dream every night, especially when I'm tired, and often times my dreams make no sense, but always have something do do with my day, and the people I interact with on a daily basis, or people I think about. Why are dreams important? : Good question, I think it's important to dream because when were are sleeping, the thoughts we have during that time are not forced, they are sort of free-flowing and random. sometimes they can help release the tensions of the day or guide us to what we should do or our next steps. Someone once recommended that I create a dream diary, where I write about my dreams and see the reoccurring themes. Something I want to get started on. What is a dream? : A dream is an unconscious thought. This can be a forewarning or insight into something about my life or what is to come. I don’t think you are limited to dreaming only when you are asleep, but also when you are awake. I think the mind works in mysterious ways, which all work in favor of what the future may hold. A dream can also be an escape from reality. An adventure. A dream is like a seed that is planted, and then it grows and reshapes and transforms into something exquisite. How often do you dream? : I dream frequently. At night, during the day, when I'm bored. How do dreams affect your real life? : I believe dreams affect my real life by guiding me through life obstacles and pleasantries. My life’s passions started with a dream. I dreamed of being on a stage in a theater with a bright spotlight on me. I can still remember the feeling of joy and happiness and the feeling of being exactly where I needed to be. Why are dreams important? : Dreams are important because I think dreams can save people. Dreams give hope when all hope is gone. Sometimes you have to dream it to believe it. Sometimes you have to dream it to achieve it. How do dreams affect your real life? : It makes me more aware of myself and surroundings. Sometimes my environment affects me without me being aware of it, but it comes out in my dreams. This allows me to sometime take a personal inventory of who and what am I surrounding myself with. Why are dreams important? : Sometimes my dreams tell me what I won't deal with in my conscious state but it manifests itself in my dreams and then I feel obligated to address it. That way at least I acknowledge what's going on with me whether it's a desire or concern. How often do you dream? : almost every night, very vivid dreams! How do dreams affect your real life? : I love analyzing my own dreams and reading different interpretations. They affect me emotionally but never my direct action in life. I take everything with a grain of salt. Why are dreams important? : Because they are your subconscious speaking directly to you! Sometimes it is so deep in there we forget to listen, but it's important to explore that side of yourself, it may have something useful to share with you!